What does it take to get by these days? This latest edition of The Cost of Living in Iowa answers this question. The report details how much working families must earn in order to meet their basic needs and underscores the importance of public work support programs for many Iowans, who despite their work efforts, are not able to pay for the most basic living expenses. 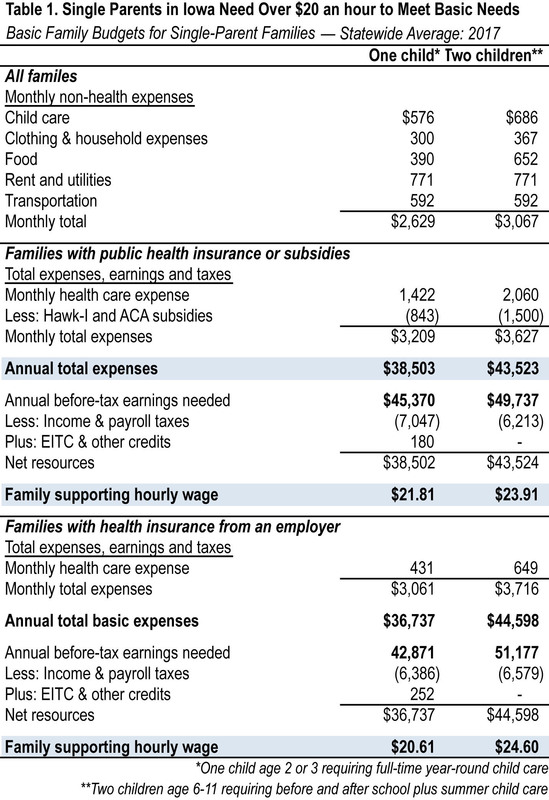 The basic-needs budgets constructed for this report represent a very frugal living standard; using costs as of 2017 (with the exception of health insurance), the budgets are based on what is needed to “survive” rather than “thrive.” This includes allowances for rent, utilities, food prepared at home, child care, health care, transportation, clothing and other household necessities. The basic budget does not include savings, loan payments, education expenses, any entertainment or vacation, social or recreational travel, or meals outside the home. Each basic family budget applies to a particular family type — given the number of family members, the ages of the children, and the employment status and ages of the adults. This report focuses on non-senior Iowa households with a working adult. Iowans pay differing amounts for the basic living essentials depending on where they live. A Linn County family and a Clay County family will face different housing costs, commuting times and health insurance premiums; child care costs will differ as well. Basic needs budgets are created for all 99 counties, and for 21 multi-county metropolitan areas and rural regions. ignored. We include here all those work supports that operate through the income tax system: the state and federal earned income tax credits, the federal child tax credits, and the state and federal credits for child care costs. We assume, in other words, that households apply for and receive all such credits when they file their income taxes. Health care is a bit more complicated. Individuals can receive health insurance coverage through an employer, on the individual market, or from one or more public programs. There are three major health care programs for low-income families: Medicaid, for adults up to 138 percent of poverty and for children up to 167 percent, Hawk-I for children in families up to 302 percent of poverty, and Affordable Care Act (ACA) subsidies, which disappear between 250 and 400 percent of poverty. The ACA subsidies operate in part through the tax system as Premium Tax Credits on the family’s federal income tax return. Like the EITC, the federal additional child tax credit, and Iowa’s Child and Dependent Care Credit, the Premium Tax Credits are refundable — the taxpayer receives the full amount even if the credit exceeds the tax due. The excess is refunded. Rather than calculate an average health care cost across all the possibilities, we model two situations: (1) the family or individual receives health insurance from an employer, insurance that satisfies the requirements of the ACA and thus makes them ineligible for the public insurance programs, and pays a share of the premiums and some out-of-pocket costs; or (2) the family takes advantage of the public health insurance programs for which they are eligible: Medicaid or the Hawk-I program covering the children and Affordable Care Act subsidies (premium assistance and cost sharing) for the adults (or for all family members if the children are not eligible for Medicaid or Hawk-I). In the second scenario the household’s net health care cost is the premium for a silver plan purchased on the exchange (for the family or only for the adults, if children are covered by Medicaid or Hawk-I), less the value of ACA subsidies received, plus the family’s out-of-pocket share of costs. The next step in our analysis is to determine the before-tax earnings needed to ensure that the family has net resources after taxes sufficient to cover the basic needs budget. We do this separately for the two health insurance scenarios. What about other public assistance programs — Temporary Assistance to Needy Families (TANF), food assistance (SNAP, the Supplemental Nutrition Assistance Program), Low Income Home Energy Program (LIHEAP) assistance, and Iowa’s Child Care Assistance Program? These four programs are not included in this analysis because they have eligibility ceilings at too low an income level (150 percent of poverty or less) to play any role in most instances. As a family’s earnings rise, they lose eligibility for benefits before they reach the level where they can meet the basic needs budget. Most families earning what we call the “family supporting hourly wage” would not benefit from any of these four public assistance programs, even though they may benefit from a public health insurance program. There are about 125,000 single-parent families in Iowa. For a single parent, the challenge of supporting a family with even one child is daunting, to say the least. 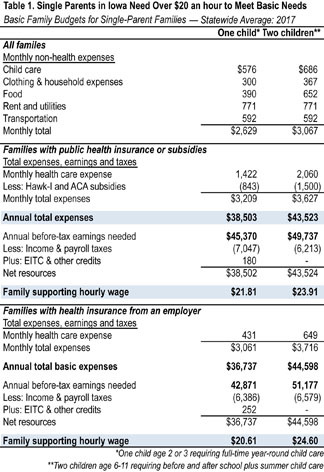 Table 1 displays the various costs single-parent households incur in order to meet their families’ basic needs. With two children, the basic annual budget exceeds $43,000 per year, when the majority of jobs in Iowa pay much less than that. 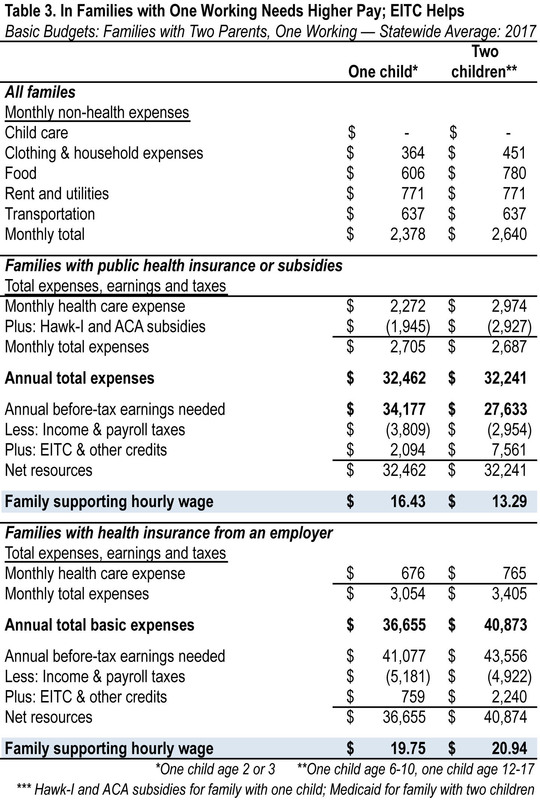 The availability of public health insurance programs, or a job with employer provided insurance, substantially lowers the needed wage, but it remains above $24 an hour for the single parent with two children, and $20 an hour with one preschooler. This is well above the median wage in Iowa, which has yet to reach $18 an hour. At these wage levels, the children are eligible for Hawk-I and the parent receives health insurance premium tax credits through the Affordable Care Act (ACA). Child care costs alone consume 18 percent of the single-parent’s family budget. With two children of preschool age, the share would be even higher. Data suggest that finding jobs with adequate wages for single parents is extremely challenging. This is particularly true for women, who head the vast majority of single-parent households in Iowa and earn about 77 percent of what their male counterparts earn. These findings underscore the critical importance of expanding work-support programs that can fill in the gaps between wages and basic living expenses. We estimate basic family budgets for five two-parent family types. First, we consider families with both parents working outside the home, and then families with one parent working and one parent at home caring for the children. In the majority of two-parent families in Iowa, both parents work full time, or close to it. Table 2 shows the situation for families with two full-time workers: a young family with one preschooler, a family with a 4-year-old and a child age 6-11 needing care before and after school and full time in the summers, and a somewhat older family with two teenagers and a child age 6-11. The availability of Hawk-I insurance for the children and ACA subsidies for the adults greatly lowers monthly expenses for Iowa’s families. 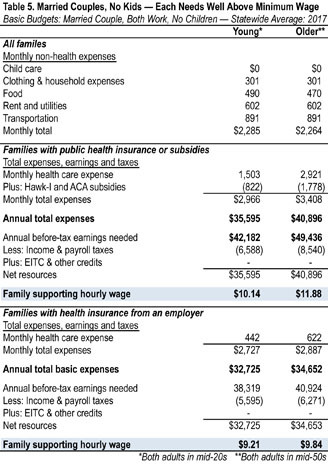 Families with one stay-at-home parent and one child (Table 3) require about 40 percent less household income than families with two working parents. This is largely because families with one stay-at-home parent do not have to pay child care costs; they also save money on transportation. However, the working parent must earn significantly higher wages than if both parents were working. 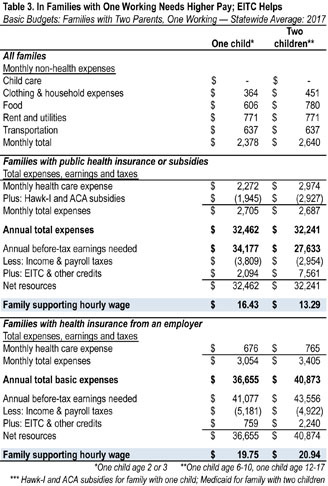 Unlike the other family types reported here, for the family with one parent staying at home the break-even wage with employer insurance is substantially above the wage with public insurance programs. This is due in part because rising premiums for group insurance have pushed employers to raise the employee share of premiums for family coverage, and with only one adult working that one employer-sponsored policy must cover the entire family. With two parents working, or with only one parent to cover, or in a household without children, a working adult can choose an employer policy covering just the employee, or the employee and one other person, where employee contributions have remained small. Single, childless adults require far less income to provide for their basic needs. With fewer expenses, a sustaining wage for a single adult is lower than the wage needed for supporting a family. Rent and transportation are the largest budget items for the single person (Table 4). 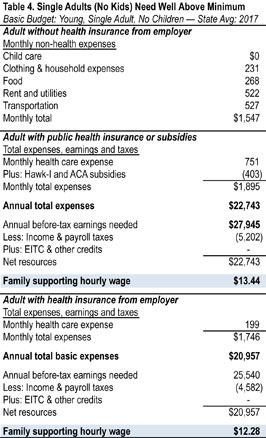 With ACA health insurance subsidies, the required hourly wage is $13.44, and with insurance from an employer to $12.28. We consider two married couple households with two full-time wage earners and no children living at home: a young couple (age 25), and an older “empty nester” couple in their mid-50s. Expenses are similar with one exception: Health insurance costs nearly double for the older couple. The availability of ACA health insurance subsidies evens out the family sustaining wage to $10.14 for the young couple, $11.88 for the older couple. With one or both receiving health insurance coverage on the job, the hourly wage falls a little further. Complete family budgets for all 99 counties and for 21 multicounty regions for each of the 10 family types in this report can be found on the Iowa Policy Project website, www.iowapolicyproject.org. For the 21 metropolitan and rural regions, and for eight large metro counties, the information includes the family-supporting pre-tax income and hourly wage, with and without public health insurance or employer-sponsored insurance. For both the counties and the regions, costs are compared with the statewide average and with the highest and lowest counties or regions. The highest-cost region of the state overall is Johnson County. The West South Central region (Audubon, Guthrie, Adair, Adams, Union, Clarke, Lucas, Monroe, Taylor, Ringgold, Decatur, Wayne and Appanoose counties) has the second highest overall costs, as well as the highest regional transportation cost. Johnson County and the Dubuque metro area have the highest child care costs in the state. Johnson and Pottawattamie counties share the distinction of having the highest rents. The lowest overall costs of living are found in two metro areas: Waterloo-Cedar Falls and Sioux City. These areas are characterized by lower than average health care and transportation costs, and moderate rents and child care costs. Johnson County and the Southwest Medica Insurance Rate Area (Shelby, Audubon, Guthrie, Cass, Adair, Mills, Montgomery, Adams, Union, Clarke, Fremont, Page, Taylor, Ringgold, and Decatur counties) have the highest healthcare costs in the state. Counties with the lowest healthcare costs include Polk, Dallas, Warren and Woodbury. Differences in cost from one county to another can be dramatic. Monthly child care expenses for a preschooler, for example, ranged from a low of $433 to a high of $675, a $242 difference. Rent for a two-bedroom apartment varied from $650 to $956 for a married couple with two children. The total annual basic needs budget for a family with two working parents and two children was $10,600 higher in the highest cost county compared to the lowest cost county. Iowa’s metropolitan areas have the highest rents and the highest child care costs, the rural regions the lowest. On the other hand, the rural regions tend to have the highest transportation costs because of the need for longer commutes. Federal poverty guidelines are the basis for determining eligibility for public programs designed to support struggling workers. However, the federal guidelines do not take into account regional differences in basic living expenses and were developed using outdated spending patterns more than 50 years ago. The calculations that compose the federal poverty guidelines assume food is the largest expense, as it was in the 1960s, and that it consumes one-third of a family’s income. Today, however, the average family spends less than one-sixth of its budget on food. Omitted entirely from the guideline, child care is a far greater expense for families today with 23.5 million women with children under 18 in the labor force. Transportation and housing also consume a much larger portion of a family’s income than they did 50 years ago. Considering the vast changes in consumer spending since the poverty guidelines were developed, it is no wonder that this yardstick underestimates what Iowans must earn to cover their basic needs. Figure 1 above shows that a family supporting income — the before-tax earnings needed to provide after-tax income equal to the basic-needs budget — is much higher than the official poverty guidelines. In fact, family supporting income even with public or employer provided health insurance ranges from 1.1 to 3.0 times the federal poverty guideline for the 10 family types discussed in this report. Most families actually require more than twice the income identified as the poverty level in order to meet what most would consider basic household needs. 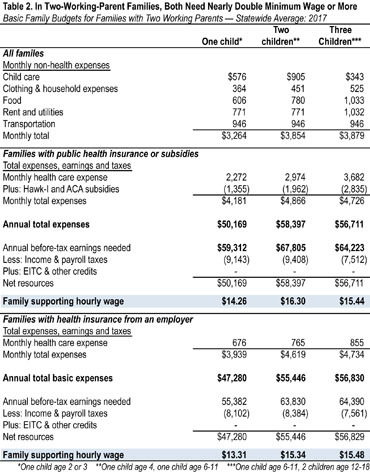 Even with public health insurance, the family supporting income exceeds twice the poverty level in all cases except the two-parent family with one worker. Since our last Cost of Living in Iowa report, some components of the family budgets have increased in cost substantially. Average housing costs in Iowa, as measured by HUD Fair Market Rents, increased 12.8 percent between 2015 and 2017 for a one-bedroom apartment, 13.2 percent for a two-bedroom. For those with employer sponsored insurance, costs rose 56 to 67 percent for families with children, 39 percent for single adults. The cost of the USDA low-cost food plan, on the other hand, fell about 0.7 percent from 2015 to 2017 for most families. Child care costs rose 2 percent statewide, the cost of clothing and household expenses increased by about 9.9 percent, and the IRS mileage rate, which reflects the overall cost of owning and operating a vehicle, fell 7 percent. 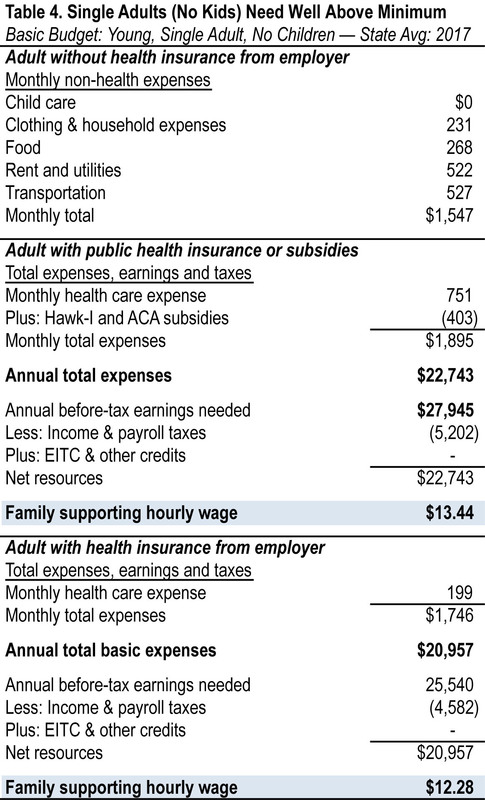 For single-parent families with public health insurance or subsidies, the hourly wage required to provide for basic needs exceeds the wage of more than half of Iowa’s current jobs (Figure 2). Any family with children would still need to earn well above $12 per hour, as would a single person. Even childless two-earner couples need to earn well above the current minimum wage of $7.25, in fact more than the $10.10 minimum that prevailed in Johnson County until the state Legislature rolled it back. The cost of living in Iowa continues to rise. 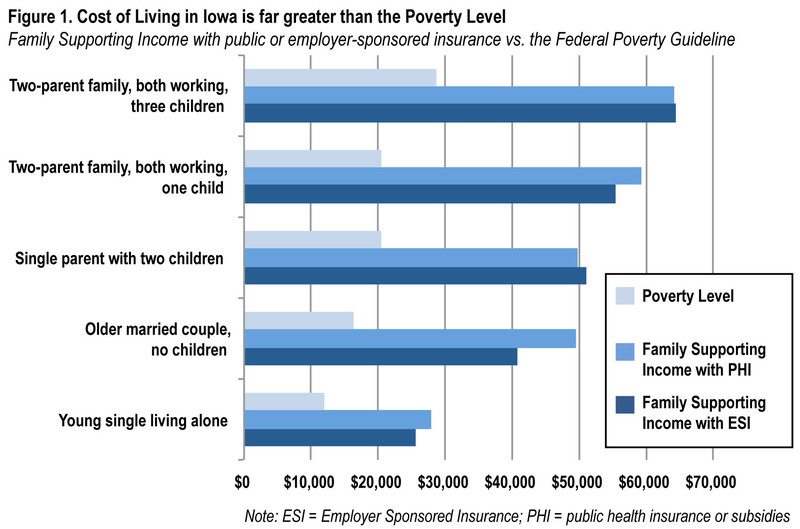 Working families and individuals in Iowa must earn substantially above the official poverty threshold — in some cases nearly three times the poverty level — to achieve a very basic standard of living in Iowa without the help of public supports. 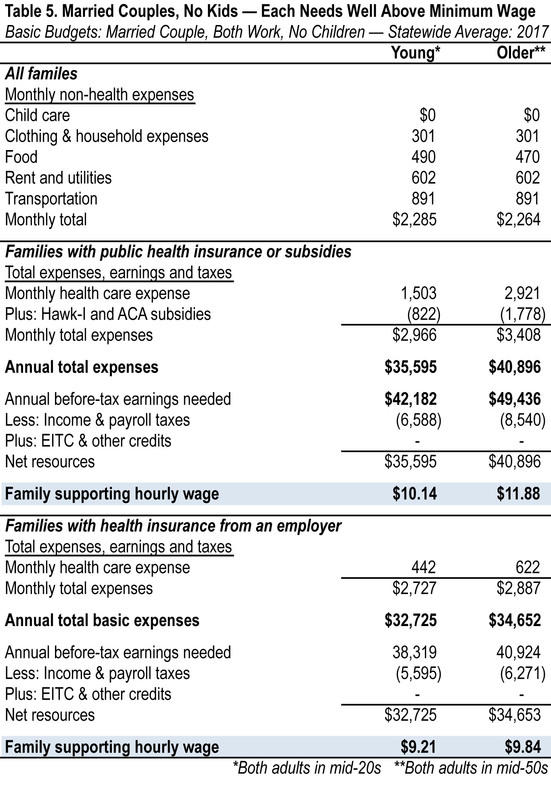 Even with assistance from public health insurance programs, single parents must earn well above the median wage in Iowa, and married couples with children must earn more than $12 per hour, well above the current minimum wage and above recent wage proposals at the state and local level. 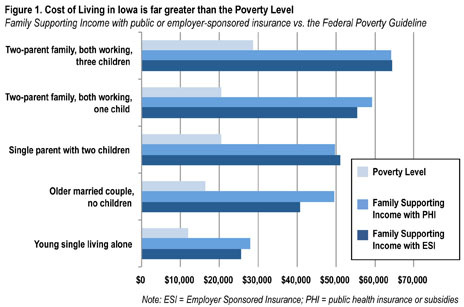 How many Iowa families earn below the family supporting income levels reported here? The answer to this question is provided in Part 2 of The Cost of Living in Iowa relying on the latest data on family incomes from the American Community Survey. 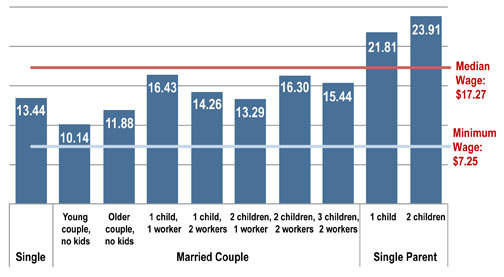 There are two exceptions: the married couples with one parent working (see Table 3). With one child, they would receive $380 in LIHEAP; with two children, they would receive $1,656 in food assistance (SNAP) and $420 in LIHEAP. Peter S. Fisher is research director of the Iowa Policy Project, which he helped to form as a charter member of its board of directors in 2001. He is a national expert on public finance and has served as a consultant to the Iowa Department of Economic Development, the State of Ohio, and the Iowa Business Council. His reports are regularly published in State Tax Notes and refereed journals, and he is widely quoted in the Iowa media on economic development and tax issues. His book Grading Places: What Do the Business Climate Rankings Really Tell Us? was published by the Economic Policy Institute in 2005, with an updated edition published by Good Jobs First in 2013. He also has developed a website, launched by the Iowa Policy Project, to follow up on that work, Grading the States, found at www.gradingstates.org. Fisher holds a Ph.D. in Economics from the University of Wisconsin-Madison, and he is professor emeritus in the School of Urban and Regional Planning at the University of Iowa. Natalie Veldhouse is a research associate with the Iowa Policy Project. She previously conducted education and health policy research with the University of Iowa Public Policy Center. As a former AmeriCorps VISTA, Natalie coordinated research efforts for the Johnson County Hunger Task Force. She holds a Master of Social Work degree and a bachelor’s degree in Ethics and Public Policy from the University of Iowa. This is the sixth edition of The Cost of Living in Iowa. As before, in order to report the most current information in a timely fashion, we are releasing the 2018 edition in installments. This is the first, and presents complete information on the basic family budgets for 10 family types and all geographic areas — 99 counties and 21 multi-county regions. These budgets are based on living costs for calendar 2017, and state and federal income taxes for tax year 2017, with one exception: Health care costs reflect insurance rates in effect for calendar 2018. Because premiums for health insurance plans offered on the federal exchange for 2018 were available in December 2017, and because health insurance premiums increased substantially over the past two years while most other areas saw only modest increases, or none at all, using 2018 health insurance premiums ensures that the budgets presented here are relevant today and throughout the year. 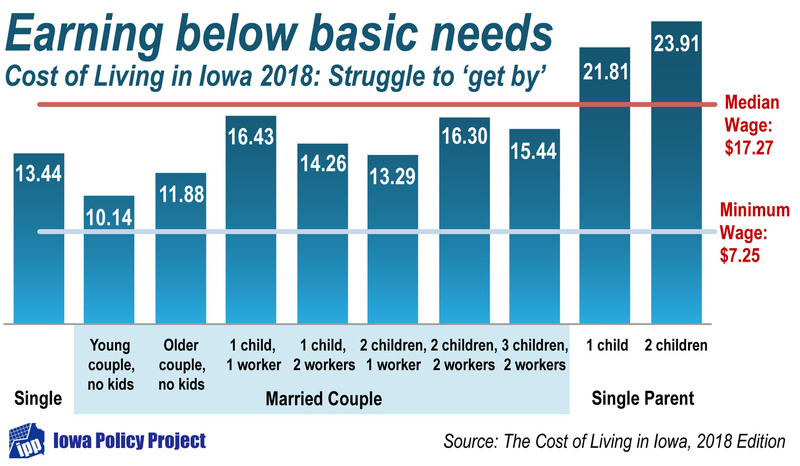 Subsequent installments of the report will focus on work supports and how they affect basic family budgets, and new estimates of the proportion of Iowa families whose income falls below the basic needs level. This edition reflects some changes since the previous edition was released in April 2016. 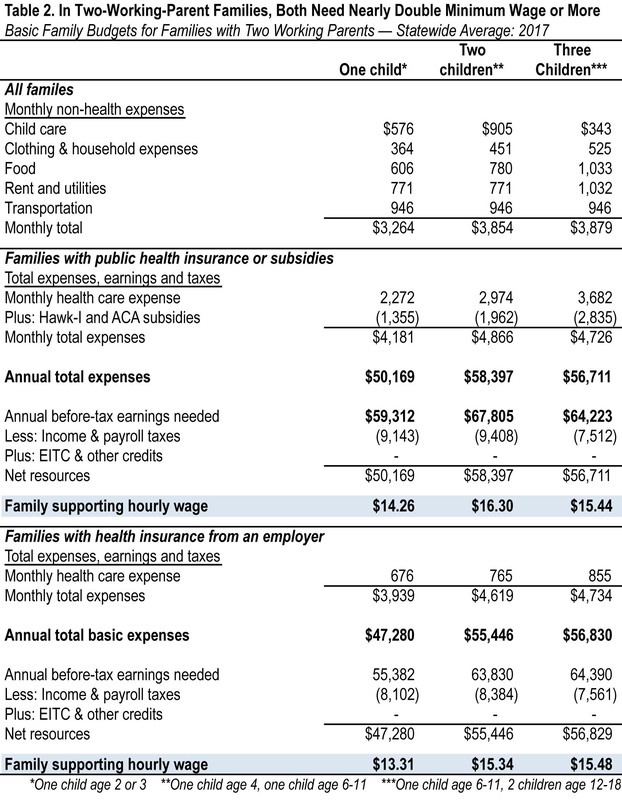 We include in this report the before-tax earnings needed by each family under two scenarios: (1) the household is able to take advantage of public health insurance programs (Medicaid or Hawk-I, Healthy and Well Kids in Iowa) and/or purchase insurance on the exchange with the help of Affordable Care Act (ACA) subsidies; (2) family members are covered by health insurance provided by an employer. Previous editions have included another scenario: the household had no insurance from an employer, and was not eligible or did not take advantage of public health insurance or ACA subsidies. Those families were assumed to purchase insurance on the private market at rates that could be found for standard policies on the state health insurance exchange. That scenario made sense at the time because the price of insurance on the exchange reflected the price of policies generally available in Iowa, whether or not the purchaser was taking advantage of Affordable Care Act premium subsidies. Since 2016, however, premiums on the Iowa exchange have increased by 140 to 160 percent, and Medica is the only company offering policies for 2018. Persons buying insurance on the exchange who are eligible for subsidies feel little of this increase, since the amount they contribute is at most 9.66 percent of their income; any premium increase above that is picked up by the ACA. But for those without subsidies, the exchange premiums are simply not affordable, and it is not clear who if anyone is purchasing insurance at these rates out of their own pockets. For example, a family of four would pay $35,689 per year on average for a silver plan on Iowa’s exchange. Many jobs that pay well enough to cover that cost — $25 an hour, or over $100,000 per year for a two-earner couple — also provide health insurance benefits. Insurance policies that cost substantially less than that appear to be available, but with widely varying coverage, co-pays, deductibles, and policy maximums that deviate substantially from the standard bronze or silver plans on the exchange, making standardized comparisons across the state, with predictable out-of-pocket expenses for the policy holder, difficult if not impossible.